Midlands-based radio company Orion Media has announced it is rebranding four of its stations under one name, Free Radio, a move that will see four long established radio call signs disappear from the airwaves – Mercia, Wyvern, Beacon and BRMB – the latter has been broadcasting in Birmingham since 1974, being the first commercial radio station in England to broadcast outside London. Orion is not the first radio company to reposition local stations that traditionally operated with different names under one brand, Global Radio being most prolific in this domain renaming most of its regional FM stations either Capital FM or Heart (indeed had Global not been forced to sell BRMB to then start-up Orion to get regulator approval for its 2007 purchase of GCap, the Birmingham station would almost certainly have now been operating as a Capital station). The logic of such a rebranding – even if it means axing 35 year old radio brands – is that, as internet radio takes off, and as many of the barriers to market entry that have traditionally protected FM radio stations from new competition slip away, and as previously local radio stations start to have national and even international reach, it arguably becomes impractical to manage and maintain numerous different brand names, in Global’s case over 40. As many of the local FMs have long shared music and programming policies, and in many cases actual programmes, why not have one brand name across the network of stations? Or so Global, GMG Radio and now Orion have asked (Bauer Media, UTV Radio and UKRD are in the main still maintaining local station names at the moment). Confirming the name changing at Orion, the firm’s CEO Phil Riley told reporters: “The decision to change the name of our stations after each one has been broadcasting in their areas under their original names for so long has not been easy or one that we have taken lightly”. He continued: “We have given this a great deal of consideration and undertaken detailed research. The original on air names of each station means a lot to all of us at Orion, and we know and understand the deep affection many people have for those names. However, the radio market has changed dramatically recently and we have to adapt and respond”. Riley added that the name changes would not affect programming or music policies at the four stations, saying: “Although the names are changing, the commitment we have to provide the best mix of music and presenters along with local news, sport, weather and traffic remains our number one priority. Even when we are in network mode on Free Radio, we will be broadcasting from and ensuring the station serves only the needs of the region”. Worcestershire County Council is encouraging anyone with a ‘get fit’ promise for 2012 to get on their bikes to stick to their resolution all year round. Cycling is an easy and convenient way to lose weight and keep healthy without the need to spend cash on gym fees or memberships. It can also be incorporated into routine daily life getting from A to B. Residents don’t need to turn themselves into Mark Cavendish overnight to start to feel the benefits of taking to two wheels as just a regular cycling routine is enough to give people effective exercise to improve physical fitness. By getting on the bike and cycling at low intensities people of all ages can get a cardio workout without the body feeling strained afterwards. The body adapts quickly to the moderate exercise that cycling can provide and whilst cycling at a lower intensity exercise people burn a higher percentage of calories as body fat. Hopping into the saddle is also ideal for anyone that doesn’t like running, jogging or walking as it’s much easier on joints. The County Council’s dedicated website section at www.worcestershire.gov.uk/cycling is packed with all the information new cyclists or those looking to jump on a bike and get pedaling again need to know. Advice on journey planning – including downloadable route maps across Worcestershire, bike security and cycling with children can all be found online along with links to local shops, forums and the Bikeability scheme, which now includes one-to-one training for adults. Ed Dursley, Worcestershire County Council’s Sustainable Schemes Manager, said: “Regular cycling is a brilliant way of helping regulate your weight and is also a very enjoyable way of travelling around. Walking is another great way of becoming more active and has always been popular here in Worcestershire with cycling becoming increasingly more popular. It sounds like a horror story straight from medieval times. Two witches descend on an ancient market town – only to be targeted by terrified Christians calling for them to be burned at the stake. But for father-of-one Albion and his partner Raven, 39, this is no historical event – it is a modern nightmare. 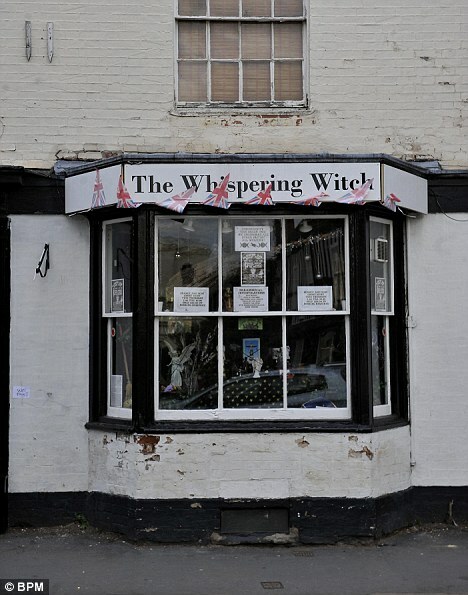 The Pagan couple opened their shop the Whispering Witch in the quaint town of Alcester, Warwickshire, around 15 months ago and claim to have been subjected to a hate campaign ever since. ‘People shout ‘burn the witches’ as they go past and we’ve had others urinating up the window,’ said Albion, 51. ‘I found a pile of wood stacked in front of the door one morning. ‘We’ve also had letters quoting extracts from the Bible telling us not to ‘promote the work of darkness’ in ‘their town’. The pair, from Redditch, have been Pagans for years and no longer use their birth names, which they refuse to reveal. ‘Things have gotten so bad that Raven has been close to a nervous breakdown,’ Albion said. ‘When she walks down the street, people cross the road to avoid her. ‘She’s been to the doctor to get help, the stress is too much. ‘It does sound like the letters are from people attending the churches because of the references to the Bible. We’ve had four in total and each one has been in different handwriting. 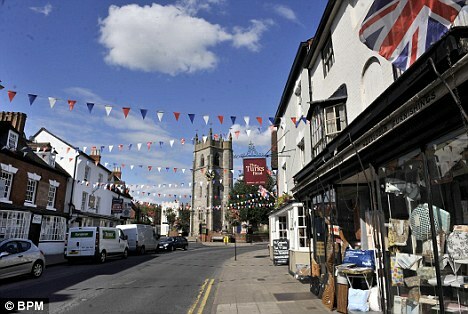 ‘It seems their main aim is to oust us from the town because they disagree with our beliefs. there are references to the devil, but we don’t believe in that as it is a Christian concept. ‘It is pathetic and unbelievable. What we are suffering is racism from people with a 16th century mentality. 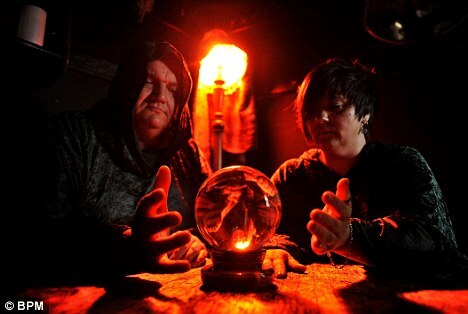 As well as selling various items like cauldrons, crystals, herbs and wands in their spooky shop, the Pagan pair hold witchcraft courses, seances and ghost hunts. ‘People come and ask us for advice and sometimes they want to be put in touch with loved ones who have passed away,’ Albion said. The couple have even organised a Ghost Festival in September to try to boost tourism. The couple have not yet reported the incidents to police, but Christians in the town say they are aware of the bad feeling. Reverend Alistair Aird, from Alcester Baptist Church, condemned those behind the attacks but added: ‘My impression is that people in the town don’t feel that this is the kind of thing they want in Alcester. ‘The murmurings are what I have picked up whilst walking around town from mothers, who have talked to me in the street. When asked about people shouting ‘burn the witch’, he added: ‘I have never heard of any of those things. However, if it is happening then it is wrong. Councillor Chris Gough, a former Mayor of Alcester and deacon at Alcester Baptist Church, added: ‘I’m aware that they are being frowned upon. Instinctively, it is not the sort of thing we want to see in the town. Batchley Support Group and Redditch MP Karen Lumley both spoke out about Tesco opening a new store in the Batchley area of Redditch. So why would they turn up for the grand opening of the store that they didn’t agree with. Karen perhaps turned up to have her picture in the Local Papers but i find it strange that Batchley Support Group would except a £500 donation from Tesco when they claimed it would ruin local shops and may even cause them to close. Batchley Support Group is run by members of Redditch Labour Party and gets grants from lots of organisations including Redditch Borough Council and the National Lottery. The Group made headlines last year after it sent Prisoners to decorate the house of Jacqui Smith. The Group at first denied any links with Jacqui or the Labour Party but it emerged Jacqui and Mrs Muckle were close friends and signed Nomination papers for Jacqui to stand for Parliament. A trustee of Batchley Support Group stands in Local elections in Redditch for Labour and in the past was a Councillor. THE ARRIVAL of a third Tesco store in the town could be the final nail in the coffin for family-owned businesses in Batchley according to residents. Members of Batchley Support Group voiced their concerns after the supermarket giant confirmed it had agreed a deal for the derelict Brock Hill Pub in Willow Way. But the group claim the Express store planned for the site threatens the future of individual shops in the district, which currently boasts a greengrocer, butcher and pharmacist. Speaking to The Standard, campaigner Maureen Muckle said the news came as a shock as no consultation had taken place and branded the situation as outrageous. “We have got a nice little run of shops and we don’t want to lose them. We’re always hearing there’s a problem with there not being enough independent shops and we’ve actually got them down here. “It’s a very sensitive area with Pitcheroak School, youngsters walking back and forth to Batchley First and Birchensale Middle Schools and St David’s and Queen’s Cottages sheltered housing and it’s very worrying that a huge amount of new traffic will be brought to the area. “I just wonder why Tesco feel they’ve got to move in without any consultation. This is about a community, that is the main thing,” she added. Redditch MP Karen Lumley said: “I’m extremely disappointed we are in a situation where the local community where I live and the shops I use are going to be placed under threat. “I think it’s a situation we need to look at possibly as a Government that Tesco and other people are buying up disused pubs on a technicality. But a few months later they have a change of heart and fall over themselves to appear in local papers even cutting the ribbon to open the store. A NEW Redditch store has celebrated its launch with a donation to the Batchley Support Group. Pattie Hill, group trustee, and Redditch MP Karen Lumley, were guests of honour when the new Tesco Express store on Willow Way recently opened. As well as cutting a ribbon to declare the store officially open, store manager Roger Perry presented the group with £500. The Batchley Support Group aims to empower local people by helping them get involved in community activities, promoting regeneration and campaign on local issues. Mr Perry said: “We are delighted to be able to support the group as it does fantastic work with the people in the Redditch community.